Almost one-third of small and midsize business owners have no business insurance whatsoever according to InsuranceBee. When the company recently researched 1,000 U.S. business owners to find out how well-equipped they are to mitigate risk, it found that of the respondents without an insurance policy, 47% are sole proprietors and more than half have a gross revenue of less than $50,000 a year. Other than insurance, 27% of business owners claim to have put money aside to help mitigate risk, while 18% say they have contracts and procedures in place. As if the day to day challenges of running a restaurant aren’t enough. The fierce competition, marketing, keeping guests satisfied and coming back for more, getting those 5-star Yelp reviews. The list goes on and on. But what about your own staff stealing from you right under your nose? Employee theft is a big problem for restaurants. Annual costs associated with employee theft in the restaurant industry are estimated at $3 to $6 billion nationally!! Employee theft is a bad situation for any business, and unfortunately it’s a common one in the restaurant industry. Restaurant employees may provide free food to their friends and family, or they may take restaurant items home or steal money and tips. Have a Theft Policy and Make it Known: Make sure every employee knows how the company defines employee theft and the repercussions of any theft. Offer annual training on the subject and have employees sign a policy. Place posters and signs around the restaurant to keep the policy fresh in employees’ minds. Conduct Background Checks: Check the references of all hired employees. If the applicant is a high school student and has never had a job before, contact his/her guidance counselor or ask for the contact information from a babysitting or dog sitting job. Use Technology: Video surveillance cameras are an excellent way to catch potential thieves, but they can also be a positive for the restaurant by pointing out procedural problems or ensuring employees are being safe on the job. Also, using technology that limits the amount of employee cash handling can deter would-be thieves. Treat Employees with Respect: Employees who are treated fairly and with respect by their employers are less likely to steal from the company. The employees feel less justified in stealing from those who care about them and treat them with dignity. Conduct a Drawer Check: Make sure the money balances out at the end of each shift. Keep a Careful Inventory: After each shift, count the remaining items and compare them to the items sold, paying specific attention to the products you sell the most of. Make employees aware that you conduct these daily inventories to deter them from trying to steal anything in the first place. Keep Your Eyes on the Trash: Employees tend to steal things when they are taking out the trash. Use clear bags to reduce the likelihood that this will occur. Get to the Root of the Problem: If you suspect an employee of stealing, move him/her to another shift. If you recognize that you are now missing items from the new shift, approach the employee calmly and ask for an explanation. Protect Your Customers: A new way of stealing from customers is called credit-card skimming. Restaurant employees will swipe the customer’s card through an unauthorized magnetic card reader to obtain their account information. Then, the data is copied and used to make counterfeit cards. To prevent this from occurring in your establishment, monitor the register closely and only allow seasoned employees to handle customer money and credit cards. Need help dealing with employee theft problems at your restaurant? Or, have other risk management issues you need guidance on? Contact me today to talk. Focus on what you do best, providing the delicious food and ambiance that will keep your guests coming back posting those 5-star Yelp reviews. The money will follow and you deserve to have it in YOUR pocket. Identify a person or persons with authority and responsibility for implementing the program. A system for ensuring that employees comply with safe and healthy work practices, including recognition of employees who follow safe and healthful practices, training and retraining, and disciplinary actions for unsafe actions. A system for communicating with employees on matters relating to occupational safety and health. It should include provisions for meetings, training programs, posting written communications, anonymous notification about hazards without reprisal, and labor/management safety and health committees. Procedures for identifying and evaluating workplace hazards, including scheduled periodic inspections to identify unsafe conditions and work practices and a system to correct them. Procedures for conducting accident investigations. Maintenance of records of safety inspections and safety and health training for each employee. These records must be kept for a minimum of one year. California Code of Regulations, Title 8, Section 3203. Injury and Illness Prevention Program. If this feels way too overwhelming for you, let me know. Give me a call or send me an email and I can work with you on developing an Injury and Illness Prevention Program for your business. 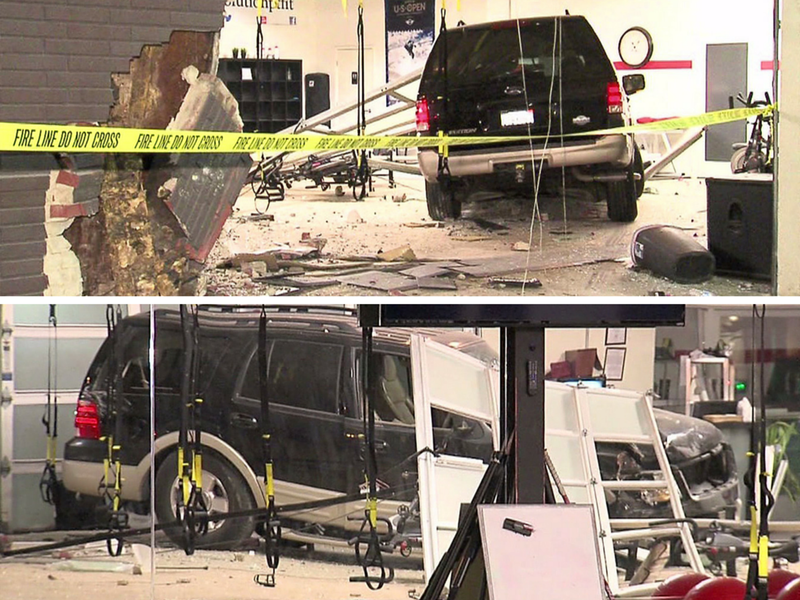 Last night, just after 10pm, a driver suspected of DUI crashed into a client’s business. This is a physical therapy office. Video from the scene showed a black SUV completely inside the building after crashing through the building’s exterior wall (see attached pic). Luckily nobody was hurt and we have the insurance carrier handling the claim now. Property loss and Business Income/Interruption coverage in effect until business is up and running again. On the bright side, this all happened during off hours. During Sunday’s baseball game at AT&T Park in San Francisco (7/12/15), a 10-year-old boy saved his dad from taking a foul ball in the side of the head off the bat of Brandon Crawford. I’m going to drop a little metaphor here. Pretend I am the kid in this video and YOUR company/business is the Dad. If you have a Life Science or Software and Information Technology Company and would like a review of your current insurance portfolio, feel free to contact me anytime. I can help market your coverage’s with all the major carriers specializing in this sector.